Estimated reading time: 6.8 mins. Last year the Perth Web community celebrated with the highly successful inaugural Edge of the Web conference. Well that conference is on again, with workshops and ending in the massive geek black tie party that is the Australia Web Awards Dinner. You wanted it over two days – you got it, you wanted more locals – you got it, you wanted more workshops – you got it. To help celebrate this year, I’m putting together this five part interview series with speakers from the Edge of the Web conference, this is part one. One of the speakers presenting at the Edge of the Web you may not know of is Matt Balara. 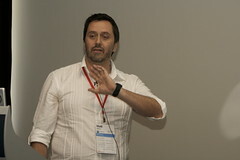 Matt hails currently from Sydney, he recently spoke, in Canberra, at the highly successful UX Australia. At the Edge of the Web Matt will be presenting on Flogging Design – Daily Disasters & Best Practice in Online Shop Design. Of late there seems to be a need to justify ones job title in the Web Design field. You are a visual designer by training. However times have changed a great deal since your formal training. What would you classify yourself as now in the new fields of Web Design and why? What I studied is called graphic design, which is a lot more than designing visuals, or decorating someone else’s thoughts. It’s first and foremost about solving communication problems, not aesthetics. Being a thinking graphic designer who has always been fascinated by what technology makes possible, I started a long time ago to try and influence web and app projects above and beyond what they look like. Since I studied, I’ve been drifting more and more into the territory traditionally owned by Information Architects and User Experience Designers (although neither term was much used back then) – I make sitemaps and wireframes and do user research and testing, and so on – but I also obsess over elegant typography, colour palettes and just the right shading on buttons. I’d be deeply indebted to you if you’d give me a job title that covers all of that and is comprehensible to clients, but doesn’t put me in a box so small I can’t enjoy what I do any more. I doubt you can, so for now it just says “Designer” on my card. Your background in the field of design, you have had an very extensive career, having designed with some big names in the Europe. Can you tell me a little about your journey in the design field from the US, Europe and now Australia and the differences you encountered? I studied in the US 15 years ago, but I’ve hardly worked there at all, so I can’t say much about it. And I’ve only been back in Australia since October last year and haven’t worked with anyone in Australia yet, so I can’t say too much there either. The last ten years I’ve worked in Germany, but other than the language and the weather, I don’t really think it’s that different. One thing maybe: when I look at the web in Australia, I get the feeling there’s a lack of sensible graphic design. I don’t know if the designers aren’t there, or if the people commissioning sites don’t value design enough. There is lots of useless, beautiful advertising wankery out there, and lots of ugly, confusing sites which should be elegant and usable. It reminds me of Europe 3 years ago or the US 5 or 6 years ago. It’s no secret you are a photography nut. It is amazing the number of web people that have a passion for photography. Do you have any theories on this, is it a lost desire to satisfy the repressed designer or just to document ones life story? Before I studied design I was a painter, so for me photography is a low commitment way of making something visual and creative for myself, like painting without the weeks in the studio. But I rarely make an image I’m happy with. In general I’d say digital photography is extremely democratic – everyone can make not-so-bad images with a camera with almost no effort. Combine that with the internet enabled superpower we all have, that we can share anything we want with potentially millions of people, and I’m sure the bosses at Nikon and Canon are happy men. Augmented Reality (AR) seems to be the buzzword on everyone’s lips this season. I know personally I see it as just an alpha pipedream. Do you ever think that AR will be ready for the big stage of the general public main stream of social communications and informational management? Back in 1993 I helped found the Virtual Reality lab at my university. That was an alpha pipedream. What we’re seeing AR now is much of the stuff we dreamed about back then, which was impossible at the time due to missing tech and a lack of interested users, becoming suddenly possible now that an iPhone is more powerful than the Silicon Graphics refrigerator that we had in the VR lab. Read “Artificial Reality 2”, written by Myron Krueger in 1991, and you’ll see that none of the ideas are new, they’re just finally possible. Personally I’m pretty excited about AR – not the marketing gimmicks, and not the thought of holding my iPhone in front of my face while walking around the city, but the excitement and energy that’s going into figuring it out, experimenting, playing, and the magical results. There’s plenty of “wow!” out there right now, and when was the last time you thought that about the 2D web in a browser box? Do I think your gardener is going to use AR to plan what to plant where this spring – will it be that mainstream that soon? No. And if iPhone based AR really takes off, it’ll mostly just fill our hospitals with people who’ve been hit by buses while staring at their hands. Until AR becomes a constant layer over what we’re seeing – and that’s a hardware issue – it’ll stay pretty gimmicky, but I think it’s starting to make a move towards useful. You recently very bravely stood up at a major Australian UX conference and declared – “ I know nothing about Agile development”. You went on to detail your experiences with Agile methodologies and their implementation in the web design field. Given this background do you see Agile as having a place for designers or is it best left just for the developers over the fence? Crap! I said that? Why didn’t you stop me?! Okay, yes, I did say that. Because it’s true. Agile has almost become a religion, and I’m not officially indoctrinated. I’m excited by the ideas, and I’ve tried some of them out as much as I could in a big agency, but I’d definitely like to get my hands dirtier and participate in a process that’s agile from start to finish. Agile is about making things, and let’s face it, we designers (UX, interaction, interface and web designers that is) don’t make things. We talk, plan and agonise about making things, but we’re not the actual makers. If you work in Photoshop, you’re painting pretty pictures of something someone else will make. If you’re wireframing you’re even further from the action. I’m personally getting sick of being so far from the things that are being made, so I’ve been brushing up on my HTML & CSS again, to be as useful as possible in the process of making – to contribute more than just my thoughts to a project. I think as long as designers are willing to drop some of the virtuoso attitude, and get their hands dirty making functional prototypes, they can absolutely enrich and profit from agile processes. Thanks Matt, see you at the edge.